Serial numbers are not the only thing that will give you a year for your Gibson. 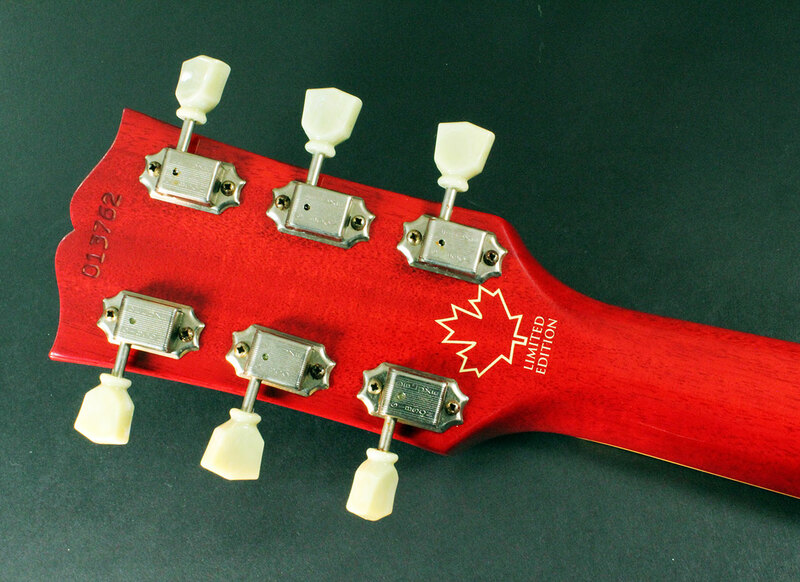 See our Dating a USA Gibson page for more info. Earlier models had an ink stamped serial number or no serial number at all, these are much more difficult to date. Around 1977, Gibson introduced the serialization method that they primarily use to this day at Gibson USA, Gibson Acoustic, and the Gibson Custom facility in Memphis, TN. 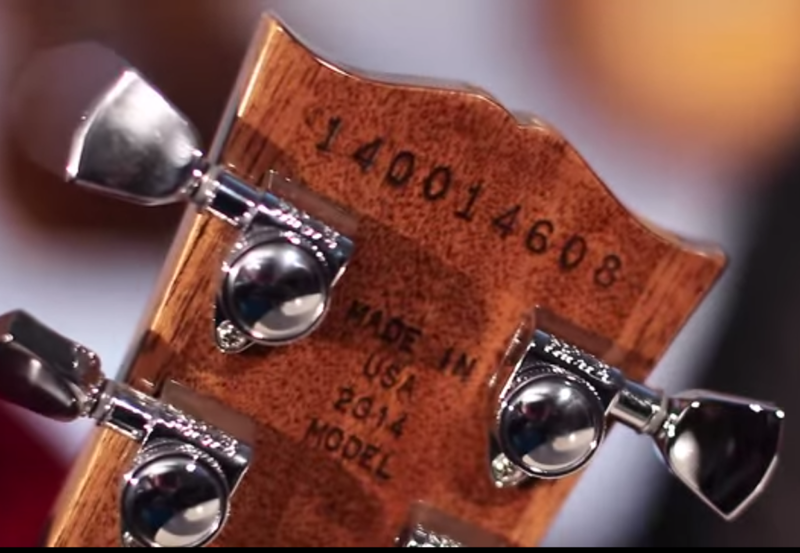 The serial number will be an 8 digit number impressed into the back of the headstock with “MADE IN USA” below. Prior to 1984 when the Kalamazoo, MI factory was closed, the numbers 001-499 indicated Kalamazoo production. Ranking numbers 500-999 continued to indicate Nashville production through 1989. 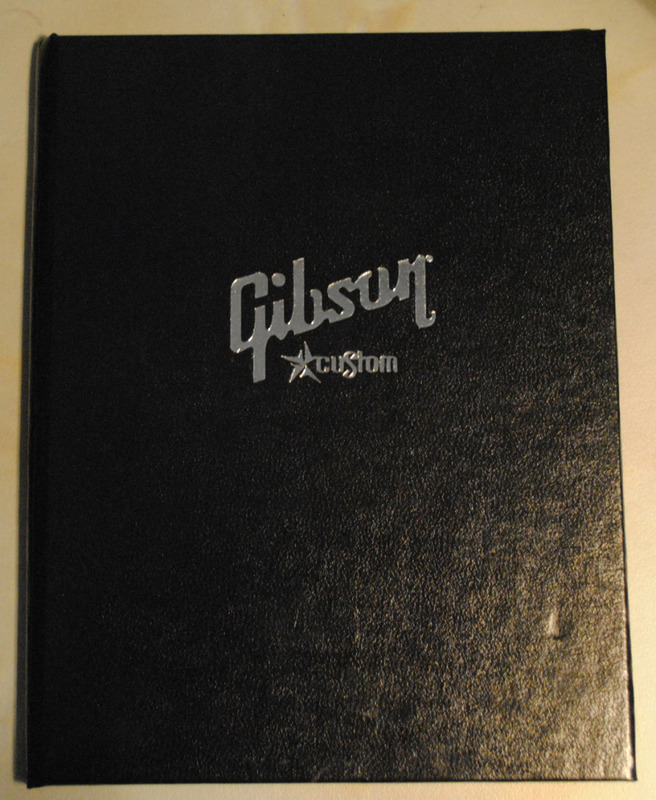 Since 1989, all Gibson acoustics are built in Bozeman, MT and all Gibson electrics are built in Nashville or Memphis. Ranking numbers for Bozeman start each day at 001 and the electrics may start as low as the 300s. Examples: 70108276 means the instrument was produced on Jan. 10, 1978, in Kalamazoo and was the 276th instrument stamped that day. 82765501 means the instrument was produced on Oct. 3, 1985, in Nashville and was the 1st instrument stamped that day. 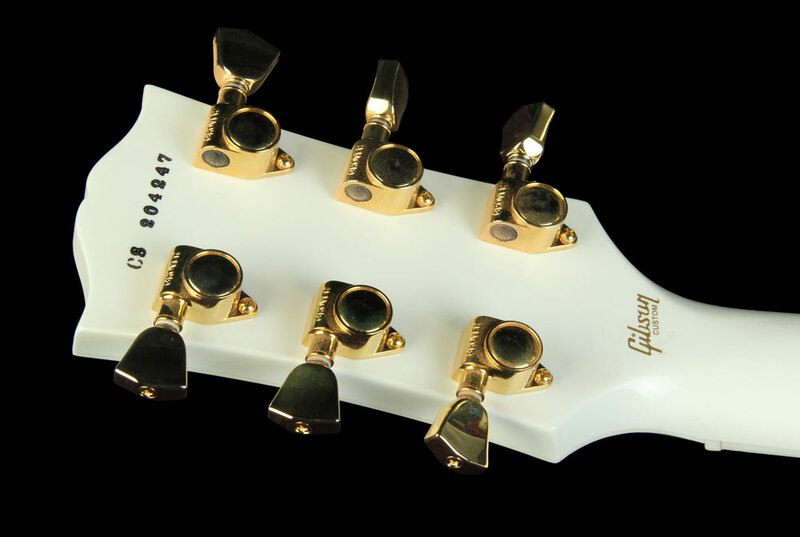 NOTE – Gibson USA goes to a 9 digit serial number in early July 2005. The sixth number is now a batch number- batch 0 starts at the beginning of the day, and once they stamp 699, the batch number will change to 1. The first 5 numbers remain the same, the last 3 numbers will remain the same. The only difference is the addition of this batch indicator. The 2014 Model Year introduces a new numbering system, the model year indicated by the first 2 digits. NOTE – Not all 2014 models have the new system. Nashville use it, Memphis may do later. Les Paul Classic: This model features an ink stamped serial number with no “MADE IN USA” (just as used on the original 1952-1960 Les Pauls). Most will be 5 to 6 digits in length, but the earliest examples feature 4 digit serial numbers. There should be a space after the 1st digit with the 4 and 5 digit serial numbers, and no space with the 6 digit numbers. The 1st digit indicates the year of manufacture for the 4 & 5 digit serial numbers, these were used from 1989-1999. The 1st and 2nd indicate the year of manufacture for the 6 digit serial numbers which have been used since 2000. 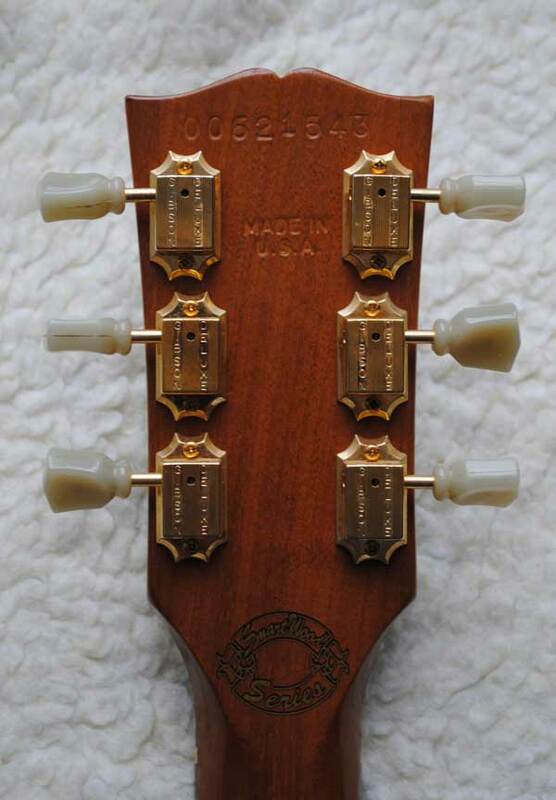 In 1994, Gibson’s Centennial year, many instruments have a serial number that begins with “94” for the year, with the remaining 6 digits indicating the ranking number. Example: CS10845 is the 845th reg. production CS model produced in 2001. Reissue custom shop models and Vintage Old Specification (VOS) follow the normal serial rules but come with a Certificate of Authenticity (COA) and sometimes a special stamp on the back of the neck. The COA is sometimes in a small black book. Thanks for pointing out the error. Custom Shop guitars are now made in Memphis as well as Nashville so an extra digit was added to indicate the factory. I visited the Memphis factory last year and was told about this but I forgot to update the blog. Most of the Gibson models designated as “Flat Top” are acoustics with a round sound hole. Others include guitars like the ES175 single cutaway models. From your description of the serial and looking in the Blue Book I think the earliest it could be would be 1961, possibly 1963 to 1967 providing that 111 is the start of the serial number and not another number such as the FON (factory order number). If you could send photos that may help, be sure to include pics of the model no., serial, FON and any stickers inside the sound holes.